I really enjoy reading motivational quotes and there are so many of these doing the rounds on social media combined as images that I thought it would be good to regularly cover quotes that grab my attention and add a bit of narrative as to how I feel about each individual quote. 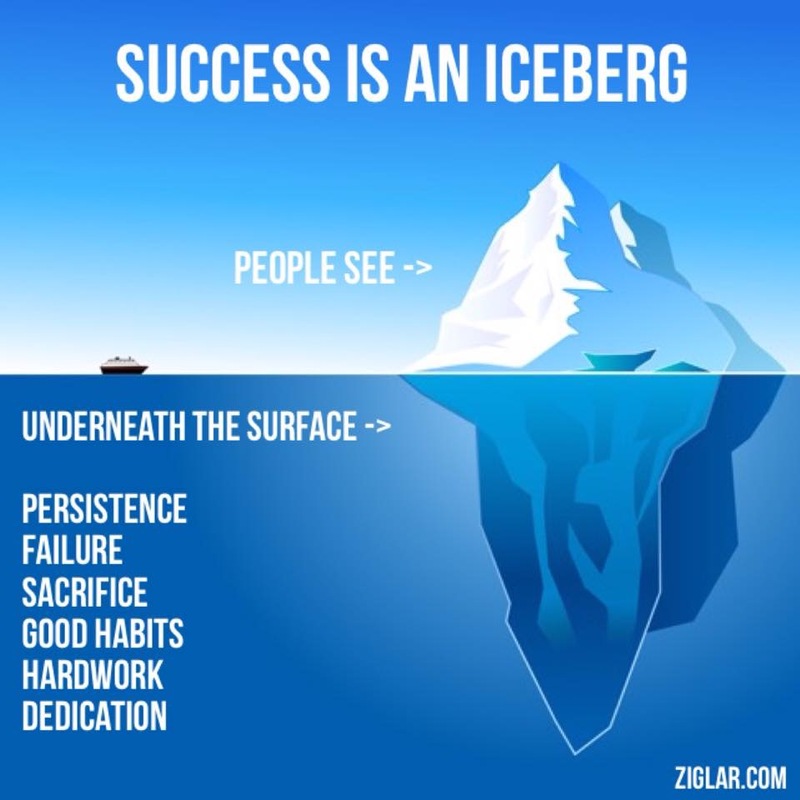 The first one of these to grab my attention is the Success Iceberg that was originally produced by Ziglar.com. This depicts an iceberg in the ocean, with the part that you can see, and the part that is underneath the water that you can not see. As we know with icebergs, the part under the water is generally much larger than the part which is floating above the water. The part you can see represents the outward success that people can see. This will be represented by your lifestyle and shiny material objects that people so commonly attribute to success. The underneath of the iceberg is the part that people do not see. I feel that it is these unseen items and sacrifices which are essential to supporting the parts of success that people can see, in the same way that the bottom of the iceberg supports the top of the iceberg and enables it to float above the surface. I can personally align with this image as people have commented on my visible success. But what they do not see is the arduous journey, hard work and dedication required in order to achieve the success. I am interested in hearing your thoughts about this concept..
Hello Andrew – funnily enough, I was thinking about this last December, when I saw that you had sold RandomStorm! I remember when I worked with you a long time ago (1997 / 1998), and saw a bit of the underneath of your iceberg, with the hard work you were putting in to the early days of your Cisco certification, and how you pursued this to become a leading authority (and author!) on Cisco security. So – I’ve seen your persistence, hardwork and dedication underneath the waterline at first hand! You are commenter number one on this blog so thanks 🙂 Getting to where I am now has taken a lot of hard work and dedication. I do not class myself to be any different than the next guy, I just worked hard towards a goal I wanted and made sure I achieved it. Oh, and did you ever get your MCSE 😉 ? Ha – of course! And have done for every major WinSrvr release from 3.51 to 2012! I don’t want any gaps in my “collection”! Recently I caught up with a friend and entrepreneur from New Dehli (he worked with us at Planet briefly on a placement), I was reminded of the unhindered ambition of indian culture at nearly every level of society, neatly summed up by the gold dust scavengers. It is hard to not consider their unbegrudged plight to be successful. Sadly England’s general culture is very different. At least for me, it’s a given success is a direct result of effort, I am always curious about the effort. In your case, I have had the privilege of knowing you in earlier days as a consultant. The admiration is not about your shiney objects, but how you got them, your dedication and ability to deliver with a Swan persona. One angle, that comes under the surface would be the family effort, the support and sacrifices they have made. Raising children is challenge and on your climb to success, I have only admiration for Helen raising four children through more modest and risky times, providing the key enabler for you to get on. Back to the shiny objects, I admire and am incredibly smug the family can share the rewards. Thanks Brian, having a powerful support network is critical and something I am going to blog about. Helen has been great at providing both support for my dreams and ambitions as well as keeping the home running like clockwork. I am sure her efforts have had a direct impact on my success within business.